At the recent P&F meeting, parents requested the return of the fortnightly e-News, which I am happy to re-commence with the circulation of this issue. Corpus Christi is such a busy school, it is important we update you on a regular basis. 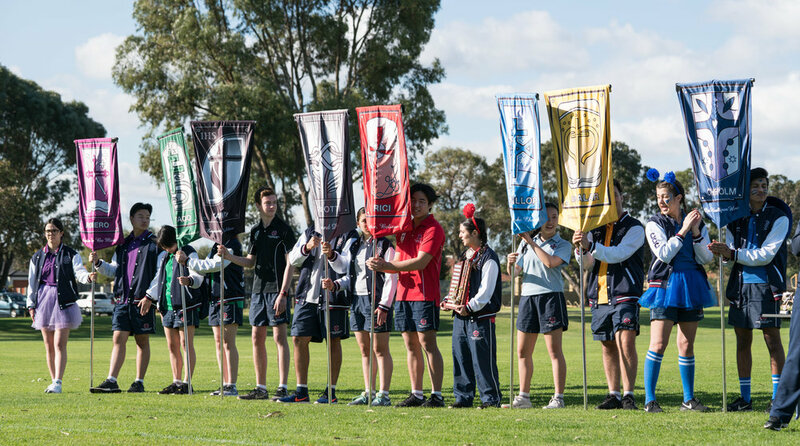 After a rain-soaked week, we experienced a bright, sunny day for our Athletics Carnival. I was delighted to chat to many parents who came along to enjoy the competition on the day. Also hosting 20 Principals for a Catholic Secondary Principals’ meeting, it was also terrific to showcase our carnival and students last Friday. Congratulations to Merici House on winning the Shield, but the real winners were all the students who entered into the spirit of the day. Year 8 and Year 11 Retreats, the Beagle Bay Immersion experiences, ‘Animal Farm’ Drama Production, Catholic Performing Arts Festival events, the Inter-House Athletics Carnival, Corpus sporting activities almost on a daily basis, Languages Week, Science Week….the list goes on! Students are offered a myriad of extra-curricular activities to enhance and support their learning experiences at the College, and the last month was no exception. Hosting more than 60 bands for the Catholic Performing Arts Festival in our James Nestor Auditorium, I commend the Arts students, and their parents who dropped them off and picked them up afterwards, and for their selfless assistance in so many ways during the 5 evenings this competition was held. Our Year 8/9 boys AFL football team had a great win last week in their Inter-district semi-final, turning the tables on CBC Fremantle who beat us in the qualifying rounds. The final score was 4.9 33 to 1.3 9. With Prendiville beating Clontarf, we will move on to play the grand final of the Eagles Cup against Prendiville. I wish coach Geoff Cantwell and his team all the best! Our school community will commence the school day on Wednesday 15 August with the Feast of the Assumption Mass held in the Community Centre. On 15 August the Church celebrates the Feast Day of the Assumption of Our Lady when according to our faith, the Holy Mother, "having completed her course of her earthly life, was assumed body and soul into heavenly glory". The Assumption signals the end of Mary's earthly life and marks her return to heaven to be reunited with Jesus. While the bodies of both Jesus and Mary are now in heaven, there is a difference between the Assumption and the Resurrection. Where Jesus arose from the tomb and ascended into heaven by his own power, Mary's body was taken up to heaven by the power of her Son. For this reason, we use different words to describe each event. One is the Ascension of Christ and the other, the Assumption of Mary. It is also a ‘holy day of obligation’. In the Catholic Church, holy days of obligation (also called holydays, holidays, or days of obligation) are days on which the faithful are expected to attend Mass, and engage in rest from work and recreation, according to the Third Commandment. All parents and friends are welcome to join us for Mass to commence at 8.45am in the Community Centre. Staff at Corpus Christi College attend professional development workshops over the course of Semester One and Semester Two after school. We offer a range of professional learning experiences across a number of domains – Catholic identity, Teaching and Learning, Digital Learning, and Accountability. An additional pupil free day is provided to all staff in Catholic schools as a token for all the extra-curricular activities, camps and retreats, which are coordinated and run by our staff. As a result, we have two pupil free days providing the community with an extended long weekend, mid-Term 3. This also assists our senior students to relax and review prior to preparing for Trial WACE and Year 11 examinations commencing all too soon. With two short weeks coming up, I hope you all have a wonderful break next weekend. Sometimes I am asked, what is different about a Catholic school education? I think the various topics covered in this copy of the e-News highlight some of these characteristics. The Solemnity of the Most Holy Body and Blood of Christ – what does it mean for all of us? Please read on…. The feast of Corpus Christi was celebrated in our Catholic parish communities a few weekends ago. This year, for various reasons, we commemorated this day at the College later in the term. We have included weekly mass at Corpus Christi to provide our community with another opportunity for nourishment. Mass is celebrated as part of our senior school Retreats, and as a staff, we commence and conclude the academic year by celebrating mass together. We also celebrate mass with Grandparents in Year 7, and on the Feast of the Assumption. This shows our College commitment to be the ‘beating heart of the Church’ in our own community. This year, we have had a group of teachers developing our Vision for Learning, which along with our pedagogical principles, or methods and approaches used to reflect learning in the College, will be released to the community at the end of the year. This working party has been so much stronger because we are ‘being nourished with the plans and affection, hopes and desires’ of all teachers, who have used the data provided by parents and students to redefine and refresh our purpose. Again, the process adopted has shown we are together as one body of Christ. A group of staff and Year 11 students are attending the Annual Corpus Christi College Immersion, which is being held at Sacred Heart School, in Beagle Bay on the Dampier Peninsula, approximately a 3-hour 4WD journey north of Broome, next term. Extracurricular experiences are an essential part of the Catholic school culture and community. The College continues to pursue opportunities for students to experience living their faith by implementing a long-term vision of immersion experiences. Pursuing this vision develops local and wider links with struggling and /or isolated communities where purposeful interaction and sharing can occur that enables faith in action. Whilst on leave for a short period this term, I was fortunate to be able to visit Sacred Heart School in Beagle Bay. I saw first-hand the work Scott Connery is undertaking, working to improve the learning outcomes of his students with the support of his Principal Lyla Forte and Assistant Principal (and former teacher at Corpus Christi) Amy Christophers. As you would recall, Scott was granted a 6-month secondment to work in this Kimberley school. Despite the lack of timber available in a fairly newly constructed D&T workshop, Scott is using readily available wooden pallets to teach students to make items which they could use. One of the projects is making a wooden cross, which I have pictured below. Although a challenging role, Scott was as energised as I have seen any teacher passionate about making a difference with students. In returning to Corpus Christi, I see this same passionate approach amongst teachers everywhere, and the generous manner in which staff are supporting each other through personal trials. The second last week of term typifies this, with the Winter Sleep Out, Year Ten Retreat Days, and Corpus Christi Day all in the one week. I know many of our staff and students would be looking fondly towards a restful holiday period. So, the funds raised on Corpus Christi Day will provide our Aboriginal brothers and sisters at Beagle Bay with enhanced learning opportunities and materials. Just as importantly, I know all involved learn from each other, deepen their understanding of ‘culture’, knowing their experiences invite a ‘two-way learning’ approach for all involved. Students and staff always come back transformed in some way! So, we ask for God’s grace as we open our eyes to the great joys surrounding us every day, wherever our students are. Veritas – what is this all about? At World Youth Day 2016, Pope Francis called young people and the Church to ‘Open new horizons for spreading joy’. Late in 2017, the Bishops of Australia responded to the call by inviting Catholics in Australia to celebrate a Year of Youth from the beginning of Advent in 2017 until the end of Ordinary Time in November, 2018. This was to be part of the time of discernment as we move towards the Plenary Council of 2020, which will be held in Perth, when the Bishops are ‘expecting to chart a course into the future, with young people a crucial part of that journey’ (Archbishop Denis Hart, President, Australian Catholic Bishops Conference). Veritas is one of the main events for Catholic youth in the Perth Archdiocese. Open to teens and young adults aged 12 to 35, we are proud the festival will take place over three action packed days on the weekend of Friday 6 – Sunday 8 July at Corpus Christi College. As Catholic Youth Ministry’s key event in celebration of 2018 being the Year of Youth, there will be incredible music, speakers, workshops, discussion forums, prayer and much more! Also, a highlight at this year’s festival will be the Christian Service Learning workshop – a great opportunity for direct dialogue between students and the agencies about what they wish to do as a volunteer. Details are available at www.veritasperth.com for the largest Catholic Youth Festival in Western Australia. We commence Term Three with a pupil free day - Monday 16 July, which is a faith-formation professional development day for all staff at the College. In the past we have utilised a number of religious order-run faith formation programs for staff, including those associated with the Jesuit and Domenican orders. Next term, we have been able to connect with a component of the Marist Faith Formation Staff Spirituality Program called ‘An Audacious Hope!’ This is closely aligned to one of the goals in our current Strategic Plan. As communities of faith, living in an increasingly individualised society, we are called to reflect on our young people’s understanding of themselves, their world and their future. If we are to remain true to our Christian mandate we need to continue to form our youth to be people of faith and hope. This program addresses the possibilities audacious hope offers in enabling us to respond to the challenges life presents. · identify that, as Christians, our hope is grounded in the Resurrection of Jesus and is one which reflects Mary’s audacity and courage. The location will be Tompkins on Swan in Alfred Cove, which means the College Office will be closed for the day. We received news this week, that Corpus has been selected as an Apple Distinguished School for 2018-2020, now a three-year designation. We have been congratulated on being recognised for continuous innovation in learning, teaching, and the school environment. This is a point of difference at Corpus, the technology serves teachers and students, and decisions made are only implemented if we are planning to make a positive difference to student learning, whether engagement or achievement. This is a whole school award, and the large number of teachers who have achieved Apple Teacher Certification is indicative of our commitment towards achieving the best learning outcomes for our students. No mean feat, I acknowledge the work of Director of Learning Technologies Daniel Budd and his team for the work they have done to assist staff and students, every single working day. In speaking with an Executive representing Apple, he stated that at a world gathering of Apple Executives, the Corpus Christi story was cited as an exemplar in secondary schooling for the Australasian region. After three and a half years, Director of Music David Harries is leaving us to join All Saints College. He has had an enormous impact on the development of the Music department at Corpus, particularly in the development of our choirs, the formation of a Band program and the inclusion of a Music tour to the Rotorua Festival in New Zealand, wonderful opportunities for our students. Students under his leadership have embraced challenges and performed at a high standard, which has included five students being awarded places at the WA Academy of Performing Arts (WAAPA), the College Celtic band winning the shield for Contemporary bands at the Catholic Performing Arts Festival and the achievement of many top awards for College ensembles at this festival and the Fremantle Eisteddfod. Ably supported by Music Assistants Abigail Radford and Lydia Gardiner in the past and present, Arts Administrator Michelle Hunt, and working with Music teacher Selena Barrett (nee Meegan), David has positioned the College well for the next stage of our development in our Arts program. We will also be farewelling Mathematics teacher Dusan Vojvodic, who has decided to pursue further studies at university and will be leaving the College after being with us for two and a half years. We are also grateful to Jenny Cullen, who has been covering Marie Drygan’s Home Economics classes whilst on she has been on leave this term. One of our most loved teachers, Elaine Liew, has been diagnosed with a serious illness earlier in the term. As she commenced chemotherapy last week, I invite the community to please keep her in your prayers as Elaine continues treatment into Term 3. Lorraine Carpenter returns from leave next term, and along with Andrew Ward, Elaine’s English classes have been, and will be, well looked after. We wish teachers who are on Long Service leave next term, all the best too: Filipa Carvalho, Joy Kinners and Katrina Thomas. New staff to the College will be introduced in the first copy of the e-News next term. High achieving students will be acknowledged and presented to the community at the Whole School Assembly on the Tuesday of the last week of term. Please note all parents are invited to attend this assembly. A complete list of those who received Academic Awards and Colours Awards will be acknowledged on the website. I congratulate these students for their dedication and commitment to their studies, which has contributed to their high achievement. Students will commence Term Three on Tuesday 17 July, after staff participate in the Professional Learning ‘Catholic Identity’ Day already mentioned, on Monday 16 July. For all parents, students and staff, please have a wonderful winter holiday break and return refreshed and ready for the challenges and opportunities that will form part of Term Three. Our Year 12 2017 graduates have now completed their final WACE examinations. We hold them in our prayers to keep safe, as a large group of them celebrate the conclusion of secondary schooling in the south-west next week. On Wednesday 6 December, the Parents and Friends have organized a Christmas Carols community event, with the support of Head of Music David Harries, the College choir and band, and College staff. At this stage, Food trucks have been organized to arrive at 5.30pm in preparation to commence food service at 6pm, with the P&F providing bottles of water. More information will come out soon, but bring your families along to this event which will be held on the upper oval in front of the new Gymnasium. Food will be available until 7.00pm after which Christmas Carols will commence at 7.15pm. 1. If there is an alert from the local police we inform all school staff of the incident details. 2. Ask teachers to reinforce the stranger danger message to our students. 3. Alert parents of children to child protection alerts by email and/or text. 5. Provide appropriate teacher supervision before and after school, and have designated pickup points for students. 6. Inform staff, parents and students that police are to be contacted on 131 444 to report incidents. I urge all students to take care when going to and from school, and to report anything suspicious to parents, school and the police – call 131 444 or the local station to report an incident to police (and only use 000 in an emergency) or 1800 333 000 to reach Crime Stoppers. · Program 000 and 131444 police phone numbers into your mobile phone. · Be aware of your surroundings at all times and who or what is nearby. · Report suspicious behaviour to parents, school and the police. · If you can get it safely, try to photograph or remember the number plate of the car and report number plates of cars and the clothing or distinguishing features of individuals to police. To get the latest community safety information from police, visit WA Police on Facebook www.facebook.com/WA.Police or online at www.police.wa.gov.au. Our Homeroom teachers will discuss some of these measures this week. If you have any concerns, please contact the College. I invite all parents to consider their nominations as a Board member for 2018 by Friday 8 December 2017. Interested parents and community members who wish to contribute in this important way are asked to consider nomination. Alternatively, parents may also consider nominating to belong to one of the committees: Finance and Risk, or the Building Committee. At the end of this year, we have three elected Board Members retiring, Russell Hardwick (Chair of the Finance and Risk Committee), Marcus Passauer and Keith Moylan. Other elected members include Board Chair Greg LeGuier, Deputy Chair of the Finance and Risk Management Committee Dr. Antonia Girardi. Chair of the Building Committee Domenic Santini, and Board members Karl Videmanis and Jens Radanovic. The College Board assists me in meeting various strategic objectives at the College. The AGM of the Board and Parent Council will be held next year. In preparation for the 2018 academic year, Board Chair Mr Greg LeGuier invites interested parents to nominate for the College Board. Interested parents and community members who wish to contribute in this important way are asked to consider nomination by contacting Business Manager Alan Luks at the College alan.luks@cewa.edu.au. Alan will then provide you with details on how to apply. I am extremely grateful to our Board Members’ voluntary service and commitment to ensure the learning experience and environment for our students continue to improve, despite changes to the State and Commonwealth grants which have presented us with financial challenges, which have been met with a modest fee increase. This has meant we have been able to keep fees affordable compared to like schools in terms of Socio-Economic Status (SES), which determines the level of funding received. Best wishes and God Bless. There has been a myriad of events in the past fortnight: Titration Stakes, Girls’ Netball and AFL finals, Boys’ AFL finals, Touch, ‘Defining Moments’ Dance Performance Evening, Public Speaking events, Atwell Art Exhibition, Philosothon at John XXIII College, just to name a few. With music students preparing for the Performing Arts Festival for Catholic Schools and Colleges in WA, and Visual Arts students preparing for the Catholic Schools Angelico Exhibition, Term Three will continue to be filled with many opportunities for students. From time-to-time, I receive ‘alerts’ from Catholic Education WA. Last week, a female student from a school in Success reported an incident in which a man driving a white sedan approached her asking if she wanted a lift to school. He was persistent so she informed him she would call the police, and as the man stopped the car, she ran away. The matter was reported to police, but I tell this story in the newsletter to invite parents to discuss ways to protect themselves from such incidents. In light of this incident, I asked Homeroom teachers to urge all students to take care when going to and from school, and to report anything suspicious to parents, school and the police – call 131 444 or the local station to report an incident to police (and only use 000 in an emergency), or 1800 333 000 to reach Crime Stoppers. Offenders and potential offenders are extremely mobile across the metropolitan area – we continue our professional vigilance in protecting your children during school time and at excursions and camps as much as we can. This is one of the reasons we have been thorough with requesting updated information prior to such learning activities via MCB. Report numbers plates of cars and the clothing or distinguishing features of individuals to police. If you have any concerns, please feel free to contact me at the College. After an extensive process, I am pleased to announce the appointment of Mr Damian Scali as the College Deputy Principal Senior School. Mr Scali is currently Acting in this role and was selected unanimously by the Interview Panel for this senior executive role at the College. Mr Scali was Acting Vice Principal at Servite College, holding the position as Assistant Deputy Principal at Servite for six years, when he joined us in 2014 as a Head of Year. Mr Scali was attracted to Corpus Christi College due to our reputation for developing leaders who are change agents, making a positive difference to student learning and engagement. Mr Scali was keen to ‘work at a college that strives for a culture of excellence, whilst providing all students with a well-rounded education with the support of the parents and wider community...’. In recent times, Mr Scali was accredited by CEWA to conduct professional development in schools, including CBC Fremantle, John XXIII College, Mazenod College and St Norbert’s College, as part of the implementation of a Child Protection Curriculum across the Catholic system. Prior to his appointment at Servite College, Mr Scali was also a Head of House and the Acting Head of Science at Kolbe Catholic College, having taught Religious Education, Chemistry, Physics and Mathematics in a range of schools including Mazenod College and Nagle Catholic College. Mr Scali holds a Master of Religious Education from the University of Notre Dame, having also completed a Bachelor of Education (Secondary) specialising in science and mathematics, and has achieved the Accreditation to Lead Religious Education qualification. As an experienced and highly committed educational leader, I am confident that Mr Damian Scali will contribute a great deal to continuing the wonderful work that has made Corpus Christi College a leader in the education of students in the Senior School. After nearly four years, serving the marketing and public relations arm of the College Cam Allen has concluded his contract. He has had an enormous impact on the College which will be ever-lasting, particularly in the design of our House crests, flags and banners, part of the ‘soul’ of the College. Cam has been involved with Corpus Christi College since he was enrolled in 1988 as a student, was appointed as Head Boy and House Captain in 1992, then returned in 2000 as an Art teacher. After three years, he left to pursue a career as a graphic designer, then returned to Corpus, initially contracted to prepare and print our Yearbook, along with other publications. Although it may be time to pursue other avenues, Cam will always be part of the fabric of the College and we wish him well in his future endeavours. After nearly three years at Corpus Christi College, specialised Literacy teacher Mrs Christine Gecas has accepted a position in Deaf Education, commencing next term. Other staff who are leaving us after covering staff on leave include Indonesian Teaching Assistant Mrs Nurmala Simbolon who was employed via a CEWA grant and Education Support Teaching Assistant Mr Luke Walkey. We wish staff who are on leave all the best: Ms Tamar Caro in Semester Two, Mrs Anna Triscari, Mrs Chanel Fenwick, Mr Linda Kenton and Mrs Kathleen Davey in Term Three. As is our custom, we will wish our staff leaving farewell at a special morning tea on Friday in the staffroom. Reverend Dr Elio Capra is a lecturer at Catholic Theological College in Melbourne and is a member of the Department of Systematic Theology and Department of Pastoral and General Studies. He lectures in Liturgy and Sacramental Theology. He is a priest of the Salesians of Don Bosco (sdb). High achieving students will be acknowledged and presented to the community at the Whole School Assembly on the Tuesday of the last week of term. A complete list of those who received Academic Awards and Colours Awards will be acknowledged on the website. I congratulate these students for their dedication and commitment to their studies, which has contributed to their high achievement. Students will commence Term Three on Tuesday 18 July, after staff participate in a Professional Learning ‘Catholic Identity’ Day on Monday 17 July. Good evening and welcome to our graduates of 2016 who are our guests of honour, Head of Year 12 Simon Messer, your parents and guardians, family members and guests, representing our parish priests, Fr Phuong (St Thomas More Parish), and Fr Nelson Po (Applecross Parish), our College Executive Leadership Team, Vice Principal Karen Prendergast, Deputy Principals Jim Elliott, Frank Italiano and Jean-Paul Papineau, and Manager of Finance and Operations Alan Luks. Caroline has been comforted by the many messages of condolence expressed by the community. Please keep Caroline and the family in your thoughts and prayers at this difficult time. Michael Penhaligon was first appointed to the College on 1 June 1991 as a teacher of students with learning needs and disabilities by the Principal of that time, Mr Tony Curtis. He also received a small allowance to coordinate the program for students in the Special Education Centre. In 2004, Vaughan Sadler created the role of Head of Education Support Unit, a role Michael held until the conclusion of 2012. Michael wanted to finish his career teaching the students he loved so dearly, and selflessly assisting the College by mentoring newly appointed Head of ESC, Sara Campbell. This testimonial clearly indicates the qualities that have made Michael a well respected and much loved staff member. Michael was well ahead of the times in terms of knowing how to best support students with disabilities or learning needs, or those who presented with major behavioural issues, in schools. He moved from the UK in 1989, initially taking up a position at Castlereagh school in Willetton in 1990. His Principal at the time noted Michael was ‘very adaptable in meeting students needs, a good staff member who works very well with students’; another Principal notes he was a ‘an extremely competent and talented teacher…who was an invaluable administrator’; these are a summary of the qualities that I believe have been a hallmark of Michael’s career. A committed parishioner at Willetton, Michael was ‘called’ to apply at Corpus Christi because we were a Catholic school with a Special Education Centre, a position he saw as vocational. We have been truly fortunate to enlist Michael in 1991, which led to our College building a very long tradition of providing exemplary programmes in support of students with disabilities for most of our history. Michael’s legacy will live on in our staff, student and family community for many years to come. Michael’s expertise and professionalism are without question, of a high standard. He came to Corpus Christi College with a broad range of professional experiences. In the UK Michael was initially employed as an Assistant Magistrates Clerk in various localities for five years, before training as a teacher, specialising in Physical Education and Social and Community Studies. A lifelong learner, Michael then completed Certificates in Counselling and Remedial Education, then qualified with an Advanced Diploma in the Education of Students with Special Learning Needs over the course of 8 years. He taught in various schools, including St Joseph’s Community Home where he became a Head of Department, and by 1983 became a the Deputy Principal in Charge of Education a the Redsands Assessment Centre in Cheshire for 4 years, a mainstream school with a special centre, caring for students across the special needs spectrum who were intellectually and physically disabled. Not resting on his laurels, Michael then moved to Grappen Hall, a special school for boys with severe emotional and social difficulties, who often presented with major behavioural issues, often placed in care by the Juvenile Court. During these years, Michael was involved in producing Individual Education Plans for every child, coordinating educational testing, reorganising the curriculum and implementing alternative programs for students, was chair of Case Conferences using representatives from multiple agencies to support each child, and was involved in the Duke of Edinburgh Award Scheme. Michael was a hard working and conscientious teacher for his entire career. Every Principal of the College has sought and valued Michael’s professional opinion, particularly on issues relating to the care and development of children with disabilities, assisting them to transition into life beyond Corpus Christi College, supporting families in many ways. Michael introduced residential camps for students, providing them with many and varied physical challenges and a variety of cultural experiences in high quality accommodation in some great locations. The camps also provided some respite for families enabling them to recharge and do something different at home, but also prepared students for mainstream experiences, such as our College Retreat programmes. Michael’s focus on providing an inclusive programme for students with disabilities has been a hallmark of his time at the College. A formal social skills programme, Peer Pals was another successful pastoral initiative, which saw mainstream students develop a relationship with a student who was primarily working in the centre, often leading to strong bonds of friendships amongst students. Some of the qualities Michael will be remembered for will be his warm, confident and outgoing personality, his positive attitude and keen sense of humour, and the wonderful way he connects with people from all walks of life. You can always depend on Michael who has been a reliable staff member for his entire career. Michael has been popular amongst both students and staff alike. He always ensures people feel at ease, listens to their needs intently, and makes each person he meets feel as if they are the most important person in the world. Parents have often commented on these personality traits, which have made him a much loved staff member of the College over the course of the past 24 years. A keen sportsman, Michael’s other great passion is Rugby Union, which was clearly evident over the course of his time at the College. When first appointed to the College, Michael had been playing Rugby for 25 years. Soon after arriving in WA Michael gained the Rugby Level 2 Coaching Award, and has held a long association with the Southern Lions Rugby Club, where he is president. Michael has also been awarded the Associated and Catholic College’s 20 Year Service Award in 2013, having been instrumental in supporting the various ‘para’ sporting events we have been involved in since their inception, all indicators of Michael’s passion for Physical Education and sport, which has never waned over the course of his career. Michael Penhaligon will now embark on a retirement that will look more like ‘freelancing’ with a number of projects he will be undertaking in the coming months. This includes improving his golfing technique, something the staff that play with him say is one of the few things Michael has not quite mastered as yet! We expect to see Michael out at Melville Glades Golf Course frequently over the next few months. I am sure we will also continue to see Mike around the College in a relief teacher capacity once he has had a well-earned rest during his Long Service Leave, and reduced his golfing handicap! I have personally known Michael Penhaligon since 2009 when I was first appointed as the Principal of Corpus Christi. I feel privileged to be the one to farewell one of our long serving staff who has given most of his career to a signature programme at the College. I salute Michael Penhaligon for his 24 years of service to our students, to the many staff who have worked with him, and to the parents he has supported in this time. Each sub-school celebrated our Holy Week Liturgy at St Thomas More Parish Church this morning. We know it is important that we remember that Easter is the main feast of the Church, when we rejoice at the triumph of Christ. The paschal mystery, the Lord’s Supper, the crucifixion of Jesus and the resurrection, form the heart of our liturgical year. Our faith is built on the resurrection of Jesus. Jesus is truly risen and is with us still. I encourage all families to attend the services within their own parishes and communities over the coming weekend. I wish all our students and staff, and their families, a happy and holy Easter. Please have a safe holiday, returning to school on Tuesday 21 April, which will commence with a Whole School Assembly with a focus on our Anzac service. All are welcome to attend.